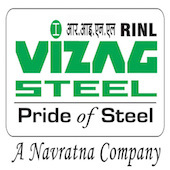 Online Application Details for Rashtriya Ispat Nigam Limited Vizag Steel Recruitment of 45 Management Trainee and 3 Junior Medical Officers is given below. Application form and duly attested documents are to be sent to Sr. Manager(HR)-Recruitment, Room No. 232, Main Administration Building, Rashtriya Ispat Nigam Limited, Visakhapatnam Steel Plant, Visakhapatnam – 530 031. In envelope super scribed with 'Application for the Post of Post Name'.